Work on my requiem for the princess has been proceeding very slowly for months, with dramatic reversals such as the swallowing up of various movemets into the aetherial nothing. But suddenly, a few days after the cremation, the requiem is simply pouring forth. I wonder whether the flames that carried the princess up to heaven did not accidentally spread, like in Götterdämmerung, to engulf the entire country as well. There is certainly a lot of "Bangkok is burning" gossip going on right now. I have a huge Hong Kong choir flying in to perform here, and I wouldn't be surprised if they found themselves singing in the air while circling the airport hopelessly waiting to land. Buddhism tells us that all is illusion. Well, as far as my immediate surroundings are concerned, all I can say is it better be true. And yet, coccooned as I am in my creative little pocket universe, I am decidedly not experiencing any negative entropy here. This is an update on the composition of Somtow's REQUIEM PRO MATRE MUSICAE (Requiem for the mother of music) which I have been working on for the last 11 months. I call it "for the mother of music" because of Princess Galyani's importance as the mother of all classical musicians in this country, and also in reference to the Blessed Virgin Mary. As you all know the work has been going slowly, and it is as if something was holding me back. But suddenly, after the royal cremation took place, the inspiration has been flowing in a constant stream. This week, I finally completed the Dies irae, kyrie, recordare, and lacrimosa movements of the requiem which mean that the first half ... the introit and sequentia ... are completely done ... about 40 minutes' music from "requiem aeternam" to "pie jesu." The second half of the requiem consists of some very big movements: Domine Jesu Christe/Hostias, Sanctus/Benedictus, Agnus Dei/Lux aeterna, and finally Libera me/in paradisum. It will be about another 40 minutes so the estimate of an 80-90 minute requiem is not far off. Most requiem composers leave out the libera me/in paradisum section, but I promised Brother Martin I would include it, and it's my aim to make this requiem mass absolutely liturgically complete. Because of the stage I am in now, I believe that it is now safe to plan to do a performance of the work that will truly do justice to the memory of HRH. This requiem is music about redemption and hope and it could appropriately be performed in May, HRH's birthday. The choir will need about 4 months' rehearsal and the work requires an adult choir of about 100 people plus two boys' choirs (children's choirs) of about 24 people each. The composition is specifically designed for a large cathedral such as the ABAC cathedral with balconies (for the off-stage brass section) and an organ plus an orchestra of about 90 pieces. This requiem is a sort of "ultimate statement" on my part, using the entire variety of musical techniques and influences that have shaped my creative output. It is equally Asian and Western, and equally archaic and modern. It's also full of very memorable tunes that can easily be hummed by non-musicians. 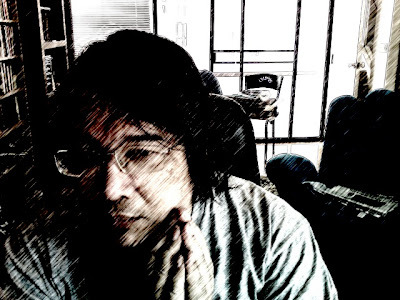 I have been very aware of the historic importance of this work as the first piece of complete catholic latin liturgy to be set by a Thai composer and therefore I think it is very important that the premiere be a highly significant occasion which reaches out to the catholic community as well as to the musical public. So you see, in a way, life is just peachy for me. Of course, I am completely penniless, but that is another matter. I have lent every penny I have to the Foundation, and this past two months I have had a singularly appalling experience ... two secretaries, one after the other, helped themselves to the Bangkok Opera's till and split. It's only a small piece of the remarkable string of catastrophes that befell me ... escalating as we grew closer to the royal cremation. Yet somehow, that inner part of me that speaks directly to The Light is now transmitting in my head, and I'm receiving the music loud and clear. Today, I am doing the fugue which tradition dictates must appear at the words quam olim Abrahae promisisti in the requiem. Fugue is not really my thing (though the same could be said of the wildest fugue writer of them all, Beethoven) so I'm clearing my head by writing this blog. I hope to have swept out the cobwebs by this evening. Perhaps we'll have a new government, too.